The journey up the spire is often gruelling – a single tricky fight can send you crawling desperately for the next rest site, while an unfortunate draw can cripple an entire run. 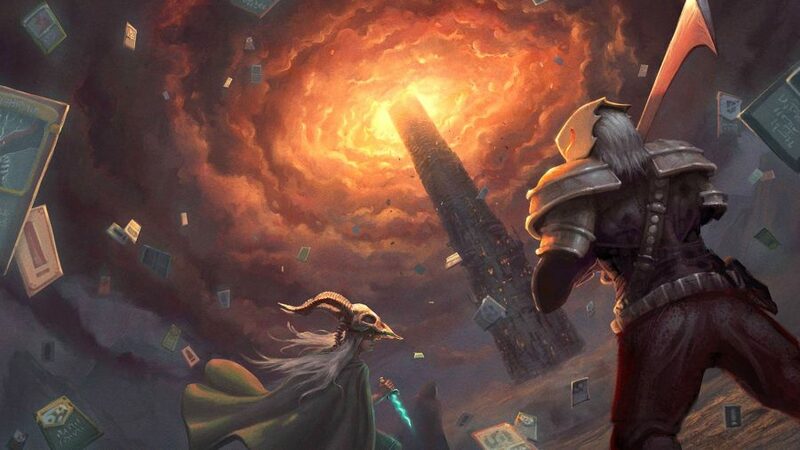 But for all of its cruelty, Slay the Spire’s brutal give and take has created one of the most captivating games of the new year. Yes, I’m willing to make that call in January. 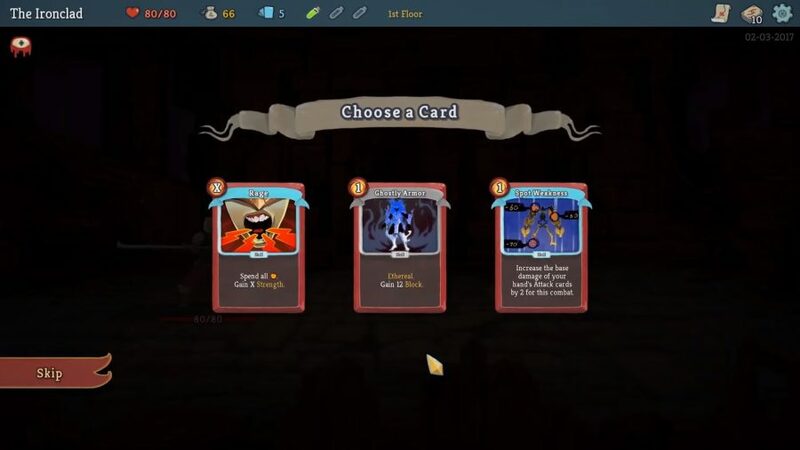 Slay the Spire is a roguelike deck-building game that shuffled into Early Access back in 2017. Each of the three playable characters starts out with a simple collection of cards, which represent their various abilities. All three classes begin with a deck primarily made up of simple attack and defend cards, which deal or block a flat amount of damage respectively, and are able to specialise with class-specific cards as they progress. Which cards you play on a given turn will depend primarily on what your opponent is going to do. As you plan your next move, your enemies’ intents are displayed above their heads, telling you whether they’re going to attack, defend, buff themselves, or hit you with a negative effect. It’s up to you to ensure you can reduce their health to zero without them doing the same to you. Dispatch them and you’ll advance further up the tower; run out of health and you’ll be starting again from scratch. When it comes to building your deck, each class has plenty of options. With the warrior-like Ironclad you might choose a build that simply augments its strength, increasing the amount of damage each attack does using cards like Flex and Inflame. But, with a card like Rupture, that same character can be twisted into a masochistic blood mage, building their power at the expense of their health. The roguish Silent, meanwhile, can choose to build a Shiv deck, full of cheap low-damage cards, or cripple an opponent over time with a Poison deck. Then there’s a sentient security robot, the Defect, which can opt to continually blast enemies with lightning, or channel one single, huge attack with a Dark deck. At the foot of the tower, low-level enemies often prove little more than a necessary innoculation against evil. They’re irritating, and often not at all threatening, but defeating them rewards you with a small amount of gold and one of three cards. What you pick up in these opening levels can often shape an entire run. A couple of early Flex pickups could send the Ironclad towards a standard strength build, while Anger might push you down a wrathful path. Passive relics, collected from boss fights and other events, have much the same effect – shaping and re-shaping a run each time you pick one up. The spire’s cruel twist, however, is that once you set off down one path, it can be difficult to divert to another, particularly if you over-invest. In the right deck, Catalyst has the potential to be a game-winning Silent card, doubling or even tripling an opponent’s poison levels. But I often select it too early and am unable to find enough cards to get my collection working effectively around it. More often than not, these situations send you into a downward spiral as you grab at any reward in the hope that it’ll improve your chances, while simultaneously diluting your deck and eroding your chance of success. Thankfully, while monsters make up the majority of the spire’s inhabitants, there are others living in its shadows. Random events can be found throughout, and offer a touch of character to the game that would be missing were combat its sole focus. The shopkeeper isn’t just a vector for more supplies, but a friendly respite, often waving me off with an encouragement to “support small businesses,” while Cleric’s enormous grin has stopped me in my tracks during the game’s early stages, signifying healing or the chance to trim some of the fat from my deck. Higher up, the spire can take on a more sinister tone. A coven of vampires coming forward with life-stealing attacks to bolster their own wellbeing at the expense of a chunk of your health, for example. Some events are genuinely unsettling, and I’ve still never completed the Cursed Tome after my first unfortunate encounter with it. Early on, these interruptions seem of little importance beyond your current run, but laced within them is a dash of narrative that, over many playthroughs, helps bring the spire to life. 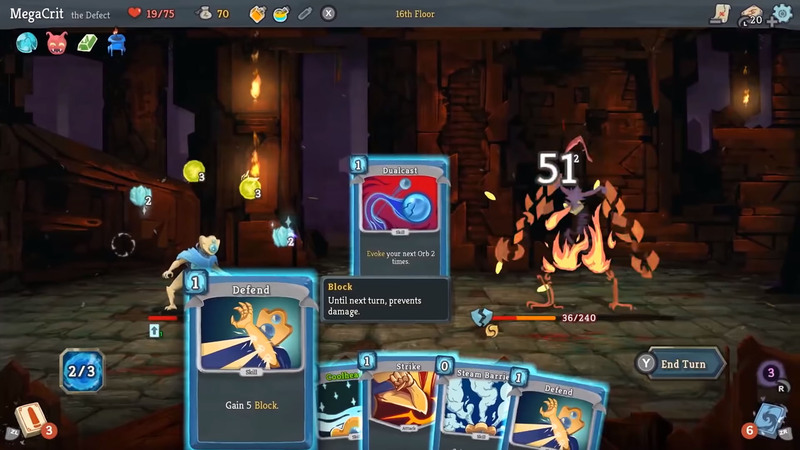 Over the past year of early access, Slay the Spire has gone from strength to strength. Daily challenges, which grant a handful of game-changing boons and nerfs to a random character, quickly became my favourite way to play, usually by throwing so many relics at a character that it’s a wonder they can drag themselves up the stairs to the next floor. Ascension mode, too, continually adds new challenges to a game that is already near-endlessly replayable – and mod support is already providing everything from brand-new classes to all-important googly eyes. Slay the Spire’s simple gameplay masks a devilishly complicated game. Synergies and counters are woven so finely together that it’s often difficult to tell which is which. A single card can appear to break a deck apart, only for a relic to stick it haphazardly back together. A triumphant run can come to a dramatic halt as an uncaring boss casually sends you tumbling to the bottom of the tower. In a year filled with high-profile card games, an early access title has somehow managed to hold my attention more effectively than offerings from Valve, Blizzard, and CD Projekt Red, while simultaneously being the best roguelike I’ve played since The Binding of Isaac. An intricate and highly replayable game that shines across both of its genres, MegaCrit’s debut combines a simple premise with near-flawless mechanical execution.